We think that Sacha Baron Cohen and Isla Fisher just might be our favourite celebrity couple. In case you missed last night’s Oscars (what, were you asleep or something? 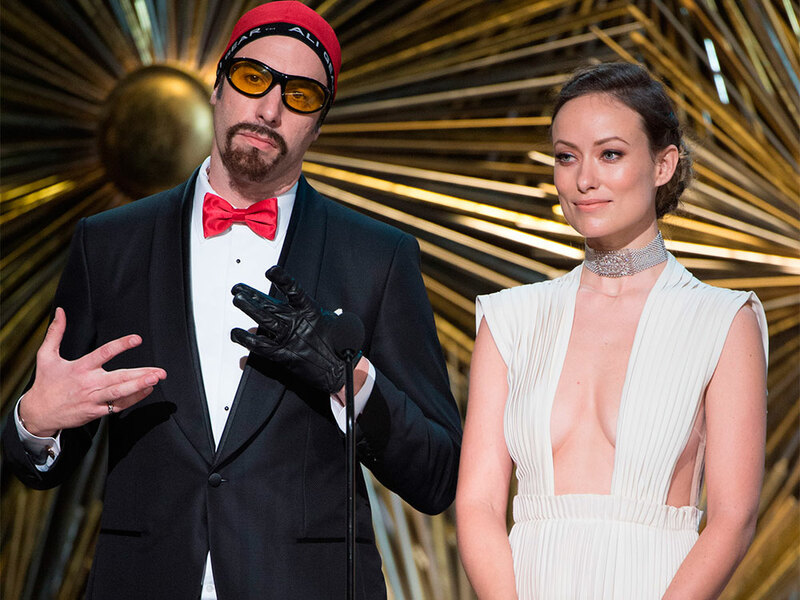 ), Sacha presented the Best Film Award as his iconic and controversial character, Ali G. Wearing his ‘Ali Gear’ cap, fake goatee, and swapping his black bowtie for a red one, the actor appeared onstage alongside Olivia Wilde. However, he was specifically told by the Academy before not to do anything ‘out of order’, which if you ask us is begging for complete rebellion. Speaking to Sky News as he and Isla entered the Vanity Fair party, he revealed that the couple hid his costume in a ‘breast feeding bag’ and told producers he had indigestion so he could get away with sneaking into the toilets. He later added to This Morning: ‘The truth is we actually had to sneak it in because the Oscars sat me down before and said they didn’t want me to do anything out of order. Now that is the very definition of true romance. The comedian who usually has nerves of steel admitted that he had some concerns about how the joke would go down with the audience, but was given the seal of approval from the man of the night. In reference to the #OscarsSoWhite controversy, Sacha took to the stage and told the audience: ‘I is here representing all of them that’s been overlooked. The audience loved it, but our favourite part of it all was co-host Olivia Wilde’s utterly bemused face.